Not done yet, but I'll finish it, soon. 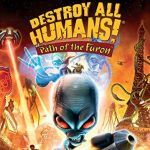 I think, this is the best Destroy All Humans game. It had some flaws, but it was very fun. Hopefully there a new DAH coming out, hopefully you should be able to drive cars! stryder237 wrote It had some flaws, but it was very fun. Hopefully there a new DAH coming out, hopefully you should be able to drive cars! yeah i hope next DAH let drive cars! Hmm... I'll look for one.